Watch the films of Ai-Ai delas Alas on Cinema One this October. Her films will be screened on two timeslots: on Tuesday Comedy (9:00 pm) and on Pop Theater (11:00 am). Comedy Queen and award-winning actress Ai-Ai delas Alas is the Artist of the Month for October on Cinema One. The comedienne started off spewing irreverent jokes in Music Box, the comedy bar alongTimog Avenue in Quezon City where she initially honed her comic skillsalong with Arnell Ignacio and Allan K.
In May 2003,her first lead starrer comedy Ang Tanging Ina, Ai-Ai became thecountry's top Comedy Queen. The sleeper hit spent a record ofnine weeks in the theaters, raked in over P250 million and becamethe box-office champion in the history of local cinema for over threeyears. She followed this with another hit, Ang Cute ng Ina Mo, in 2006.Its 2008 sequel and contender in the December Metro Manila FilmFestival Ang Tanging Ina ‘Nyong Lahat ruled the box-office and enjoyeda five-week screening across the country. In 2009, she admitted shereached an ultimate high of her career when she shared equal billingwith Megastar Sharon Cuneta in the hit BFF (Best Friends Forever). With hername, charisma and appeal certified for the masses, Ai-Ai delas Alas has been chosen to reign overCinema One this October. Her movie blocks will kick off on Tuesday Comedy every 9:00 pm with Ang Cute ng Ina Mo on October 6.This comedy of director Wenn Deramas also stars Luis Manzano, AnneCurtis, John Lapus and Eugene Domingo. Portraying a mother to a prettydaughter who wants to know the identity of her father, Ai-Ai goes throughvarious antics to endear herself to her estranged loved ones. Pasukob on October 13is a parody of Star Cinema's cinematic gem Sukob. Ai-Ai acts opposite Rufa Mae Quinto, making them virtually sisters who find humor even in death. Kapag Tumibok ang Puso (Not One But Twice) on October 20pits Ai-Ai with Precious Lara Quigaman and Bong Revilla in arambunctious tale of exchanged identities that leaves everyonelaughing. Ang Tanging Ina ‘Nyong Lahat on October 27 makes Ai-Ai the mother who this time treads politics and aims for the Presidency. On Pop Theater every 11:00 am, Ai-Ai becomes a mother who runs for her life when untamed souls go after them in Shake Rattle and Roll 2K5 on October 19. Volta on October 20 turns Ai-Ai into a super hero when electricity went inside her body. Pinay Pie on October 21 with Joyce Jimenez and Assunta de Rossi make them the trio of women who decide to empower themselves. Pakners on October 22is where she becomes the loud-mouthed girlfriend of none other thanFernando Poe, Jr . She haunts him for leaving her just like that. Ang Tanging Ina on October 23is where she becomes a mother to 12 kids and left by three handsomehusbands who all died, leaving her with the responsibility of rearinga big household. 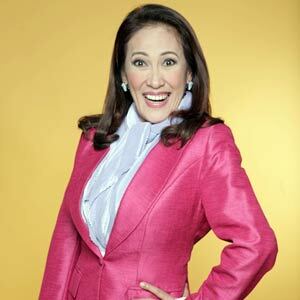 See the body of work of Ai-Ai delasAlas and experience what makes her brand of comedy different from other comics today. Cinema One is available on SkyCable Gold, Skycable Silver and otherquality cable operators nationwide.